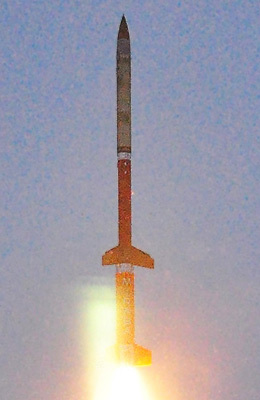 The VSB-30 is a two stage Brazilian sounding rocket. 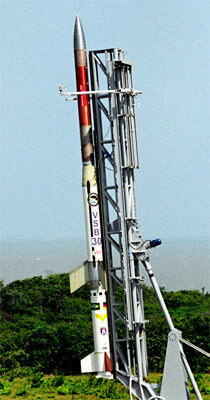 It consists of a S-31 rocket as first stage combined with a VS-30 second stage. The VSB-30 vehicle is a two-stage, unguided, rail launched sounding rocket, consisting of a solid propellant S31 rocket booster, a boost adapter, the second stage S30, payload, a recovery and a service systems. Motor and payload are connected by an adapter section and they are separated by pneumatic pistons. The vehicle is designed to fly in a spin stabilized unguided mode. The spin stabilization is achieved by using canted fins. To reduce impact dispersion, the vehicle is equipped with three spinup motors, installed in the booster adapter. The fins are arranged in the standard three-fin configuration and they are nominally set to 18’ (S31) and 21’ (S30), respectively, causing the vehicle to spin from lift-off through burnout. The roll rate at burnout is approximately 3.3 Hz. Total burn time for the S31 is 16.0 seconds and 32.0 seconds for the S30. Both motors have a 55.7 cm diameter. The typical length is 12.6 m, depending on the payload. The rocket can carry a payload of 400 kg to an altitude of 270 km. The rocket has been used from a number of launch sites: Alcantara in Brazil and Andøya and Esrange in northern Europe. A launch from Woomera is also planned. The S-31 improved Orion is a combination of the VSB-30 stage 1 booster with the US built improved Orion as upper stage. This combination was devloped for The O-STATES mission to be launched from Esrange. It carries a payload of 225 kg to an altitude of 240 km. The S-31 improved Malemute is a combination of the VSB-30 stage 1 booster with the US built improved Malemute as upper stage.